In a heavy saucepan, melt the butter. Add the onion and garlic and cook until translucent, about 10 minutes. Add the remaining ingredients and bring to a low simmer. Continue cooking until the sauce begins to thicken, 20 to 30 minutes. Taste and adjust the seasonings with salt and pepper if desired. Let the sauce cool for about 10 minutes and puree with an immersion or in a traditional blender. Let cool completely before transferring to a tightly covered container. Refrigerate for up to 2 weeks. 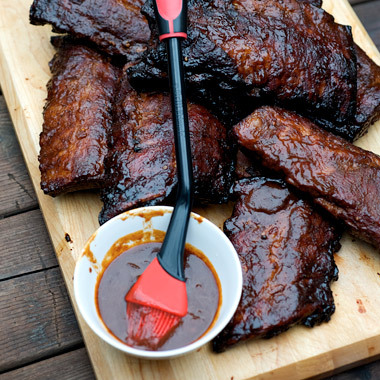 Brush it on ribs, chicken, pork, or beef 5 to 15 minutes before the cooking time is finished. If desired, serve extra on the side.